28th August 1906, 52 Parliament Hill Mansions, Highgate, London, England. John Betjeman was the only child of a furniture maker. Byron House School. Highgate Junior School. Dragon School, Oxford. Marlborough College. Sent down from Magdallen College, Oxford. 1909: The Betjeman family move to 31 West Hill in Highgate, London. 1915: He writes a poem whilst at junior school about the Zeppelin raids which are happening over London during the First World war. 1916: John Betjeman gives a copy of his work “The Best of Betjeman” to the Poet T.S. Eliot, who was then one of his teachers, despite the fact that he is only ten years old. 1917: Goes to Oxford and is inspired by the churches and other buildings. Family moves to Church Street, Chelsea, London. He spends his summer at the family cottage in Cornwall. 1920: Meets Louis McNeice and Anthony Blunt at Marlborough College. 1924: Publishes two Poems “The Heretick” and “Ye Olde Cottage” in the “Marlburian” School Magazine. Writes letters to Lord Alfred Douglas (“Bosie” to Oscar Wilde) until forbidden to continue by his father. 1925: His English Tutor at Oxford University is C.S. Lewis, although neither particularly liked the other. Mentioned many of his acquaintances at Oxford later in “Summoned by Bells”, amongst them W.H. Auden and Evelyn Waugh. 1926: John Betjeman writes his first poem for the “Isis”, the Oxford Magazine. Visits Ireland and Gloucestershire with wealthy friends. 1927: He becomes Editor of “The Cherwell” magazine at Oxford. 1928: Fails his divinity examination and leaves Oxford in disgust. On his return he is sent down. 1929: Becomes private secretary to the politician Sir Horace Plunkett, but is dismissed after only two months Becomes a school teacher at Heddon Court, East Barnet in London looking after the cricket team. 1930: John Betjeman begins work at the “Architectural Review” magazine and helps promote modern styles by Le Corbusier and Charles Rennie Mackintosh. Wrote “Death in Leamington” for the London Mercury. 1931: Becomes engaged to Camilla Sykes but then falls in love with Pamela Mitford and Penelope Chetwode. Edward James prints his work “Mount Zion” privately. 1932: Works on his ideas for the Shell Guide to England series. 1934: Edits the first Shell Guide, “Cornwall Illustrated”. Becomes film critic for the London newspaper the “Evening Standard”, but leaves after only a few months. 1936: Edits the Shell Guide. “Devon”. 1937: “Continual Dew” his second Collection of Poetry is published by John Murray. 1939: Works for the Films Division of the Ministry of Information at the start of the Second World War. 1940: Publication of “New Lights and Chancels”. 1941: Becomes United Kingdom Press attaché in neutral Dublin. The IRA seeks to assassinate him because he is a British spy doing work for the Admiralty. 1945: Publication of “New Bats in Old Belfries”. 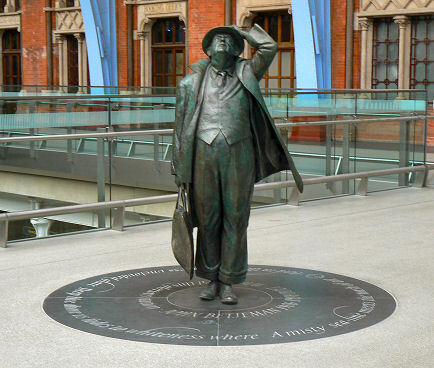 After the War John Betjeman worked for various newspapers and geographical guide book companies. 1954: Publication of “A Few Late Chrysanthemums”. 1958: His “Collected Poems” sells very well and receives enormous popular acclaim. 1960: Publication of “Summoned by Bells”, his autobiography written in blank verse. Awarded the Queen’s Medal for Poetry and the CBE (Companion of the Order of the British Empire). 1962: Begins working on his television series about towns to the west of London built on land belonging to the Metropolitan Railway called “Metro-Land”. 1966: Publication of “High and Low”. 1968: John Betjeman made a Companion of Literature by the Royal Society of Literature. 1969: Awarded a Knighthood by Queen Elizabeth the Second. 1972: Appointed as the Poet Laureate on the death of Cecil Day Lewis. 1973: He is made an Honorary Member of the American Academy of Arts and Letters. 1974: “A Nip in the Air” is published. 1983: Names a railway locomotive after himself, the Sir John Betjeman. 1940: “Old Lights for New Chancels”. 1944: “New Bats in Old Belfries”. 1954: “A few Late Chrysanthemums”. 1972: “London’s Historic Railway Station”. 29th July 1933 to Penelope Chetwode, at Edmonton Register Office, London. 19th May 1984, Trebethenick, Cornwall, England, of Parkinson’s Disease. St. Enodoc Church, Trebethenick, Cornwall. Memorial in Poet’s Corner, Westminster Abbey, London. He particularly liked this part of the Country and produced several guides. Tom Brown’s School Museum, Uffington Ferringdon, SN1 7RA.